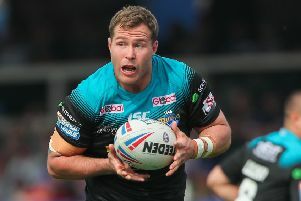 Leeds Rhinos have revealed a new-look black and aqua away kit for the 2019 season. The front of the shirt features the Leeds Building Society logo, which is also on the shorts, along with the logos of associate partners Global and Berrys and official kit suppliers ISC. The sleeves have the branding of new club partners Southerns, part of the Extentia Group, along with the Betfred Super League logo. Three more partners are on the back of the shirt with Quest joined by LSS Waste Management and FPS. The kit is completed with aqua shorts and black socks with an aqua band around the top, both feature the logo of SMUK.